Obama Basks In Latino Politicians' Love After His DREAM Moves : It's All Politics If the president looked confident of his audience's support Friday, he had every right to be. Polls showed him enjoying a large lead over Mitt Romney even before Obama's action to stop deportations of some young illegal immigrants. 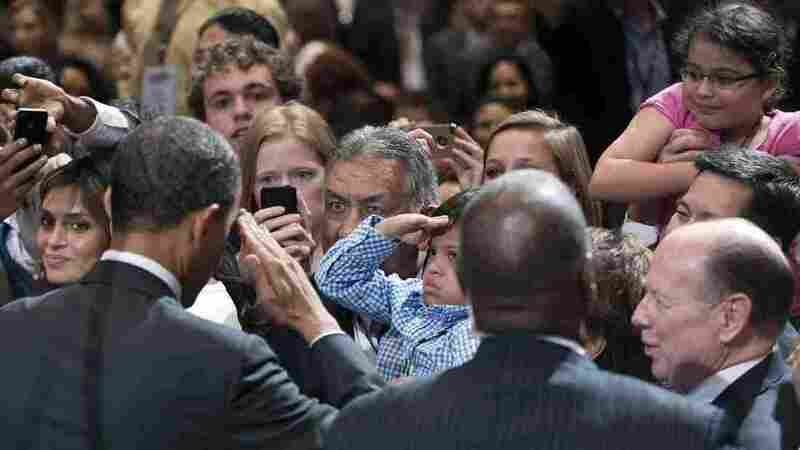 President Obama returned a young fan's salute at the conference of the National Association of Latino Elected Officials in Orlando, Fla.
Coming a week after President Obama announced that he would defer deportation proceedings for many young illegal immigrants, it was safe to predict that he'd get an appreciative response from an audience of Latino leaders. They didn't disappoint. It started with a woman in the audience at the National Association of Latino Elected and Appointed Officials shouting, "We love you," shortly after Obama took the stage, and never diverged much from that. The president received repeated applause, especially when he discussed his recent actions to put into place elements of the DREAM Act. Long stalled in Congress, the act would allow many young people brought into the U.S. illegally by their parents to obtain permits that would let them legally work or attend college. Clearly sensing he was among mostly political friends, Obama used the opportunity to take on his Republican challenger, Mitt Romney, who spoke at the conference the day before. "Your speaker from yesterday has a different view. In his speech he said that when he makes a promise to you he'll keep it. Well, he has promised to veto the DREAM Act. And we should take him at his word." The president paused to let the audience's applause and cheers die down, as well as for dramatic effect, then added: "I'm just saying." "I believe that would be a tragic mistake. You do too." Because the economy and jobs are the main issues for voters across the demographic spectrum, Obama touted tax cuts he signed to help small businesses and initiatives to make higher education available to more people through expanded Pell grants and aid to community colleges. The president defended his signature health care law, whose fate could be determined by a Supreme Court decision next week, as "the right thing to do." "In 2008, candidate Obama promised NALEO he would create new jobs and end the housing crisis. Four years later, President Obama is back asking for more time. No election-year speech can cover up the president's job-killing policies that have led to 11 percent Hispanic unemployment and millions of Hispanics living in poverty. On Day One, Mitt Romney will take our country in a new direction and get our economy back on the right track." It was immigration, an issue on which Romney got a tepid response at the same conference the day before, that Obama got the most enthusiastic feedback. The president used the issue to underscore one of his favorite 2012 campaign themes: The solutions to the problems now facing the nation are well known. What's lacking, he argues, is the will of Republicans to reach any deals because of the pressure from their party's right wing. Obama referred back to the bipartisanship that existed during the failed attempt by his White House predecessor to get immigration reform legislation enacted in 2006. "Just six years ago, an unlikely trio — John McCain, Ted Kennedy, President Bush — came together to champion comprehensive immigration reform. I, along with a lot of other Democrats, were proud to join 23 Senate Republicans in voting for it. "Today, those same Republicans have been driven away from the table by a small faction of their own party. It's created the same kind of stalemate on immigration reform that we're seeing on a whole range of other economic issues. And it's given rise to a patchwork of state laws that cause more problems than they solve and are often doing more harm than good. "... We should have passed the DREAM Act a long time ago. It was written by members of both parties. When it came up for a vote a year and a half ago, Republicans in Congress blocked it. The bill hadn't changed. The need hadn't changed. The only thing that had changed was politics." Obama continued his feisty declaration by saying that he couldn't agree more with his congressional critics that Congress should ultimately take steps to reform the nation's immigration laws. "For those who say we should do this in a bipartisan fashion — absolutely. My door has been open for 3 1/2 years. They know where to find me." If Obama seemed confident, he had every right to be, according to polls that show the president enjoying a large lead over Romney among Latinos. A poll released Friday by Latino Decisions and America's Voice showed Obama with large leads over the all-but-official Republican presidential nominee in several battleground states. And the energy for Obama among Latino voters only seemed to be increasing, according to pollsters.